"On n'est pas sérieux quand on a 50 ans"
"Les nuages... Là-bas… Les merveilleux nuages"
Converging views on three collections of drawings from the Musée des Beaux-arts of Rouen, the Musée d’Art Moderne André Malraux in Le Havre and the FRAC Haute-Normandie. 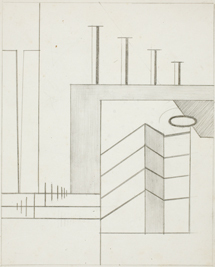 The converging views on three collections of drawings continue at MuMa, home to Olivier Senn's remarkable collection of drawings, bequeathed to the museum by Hélène Foulds in 2004. This exhibition coincides with the museum-wide celebration of the city's 10-year anniversary as a UNESCO World Heritage Site and provides a strong parallel to Bernard Plossu’s photographs of Le Havre. Consistent with this program, the works selected from the three collections show a broader approach to architectural drawing. While some borrow from the expressive techniques specific to technical drawing, none of them are, strictly speaking, preparatory sketches. The drawings selected for this part of the itinerary explore a different path: from the ruins of Hubert Robert to the architectural utopias of the 21st century that are not unlike the Auguste Perret or MuMa buildings, the exhibition highlights different forms of architecture, both imagined and imaginary. Ever since the inauguration of the Musée-maison de la Culture by André Malraux in 1961, MuMa has forged a reputation for its late 19th-century and early 20th-century collections, notably featuring Impressionist artworks. The museum also, however, has an underlying utopian component: the building and layout were designed as a flexible whole in a state of perpetual renewal.